It's no secret that your LakeCountyEye has been living the lavish lifestyle of a McHenry County blogger, all thanks to the generous support of grants from the NEA, NIH, NSA and other Federal agencies. But with the smackdown shutdown this week of the Federal Government, it is unknown how long the LakeCountyEye lifestyle, that your LakeCountyEye has grown accustomed to, can be maintained. Ordinarily this level of uncertainty would be enough to drive your LakeCountyEye to drink. 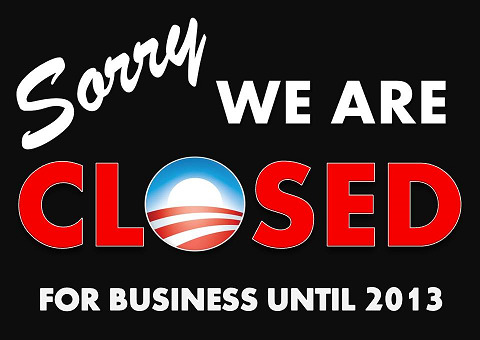 Luckily on the very same day the government shut down, ObamaCare became the law of the land -- and not a minute too soon. Your LakeCountyEye can now look forward to a steady flow of government subsidized mood-altering pharmaceuticals, and for many years to come! Of course not just your LakeCountyEye is feeling the pain of a government shutdown. Whether you know it or not, everyone in Lake County will be impacted, some way or another. Here are 10 repercussions of the government shutdown that may affect you. Without Federal money, entrance ramps will not be built on the Route 53 Extension. Federal medicinal marijuana DEA agents furloughed. The Six Flags Over Great America National Park will be closed. Lake County backyard chicken eggs will not be FDA approved. Marshals will not be deployed to the Lake County Election Commission, to enforce the Federal Voting Rights Act. The Bureau of Alcohol, Firearms and Tobacco discount outlet shops will all be closed in Lake County. INS agents will not be guarding the Wisconsin border. The Zion Nuclear Plant will be shut down for the duration. Your Second Amendment rights are suspended. Look for your LakeCountyEye applying for food stamps, near you.